A safety law that truckers hate is driving up prices for consumers on everything from groceries to Amazon Prime. Here’s what you need to know about it. In 2018, the trucking industry went through an upheaval because of the implementation of the electronic logging device mandate. The ELD mandate enforces the hours of service law, which how much truck drivers can drive and when. They cannot drive for more than 11 hours during a 14-hour period. Many truck drivers have told Business Insider that they hate ELDs, which make their jobs too inflexible. Industry experts say the law helps promote safety. The ELD mandate has also helped make products more expensivefor regular consumers. At the end of 2017, Dalton Jackson’s job suddenly became unbearable. “Everything got worse due to the ELD law enforcement in December,” Jackson, who lives in Chestertown, Maryland, told Business Insider in May 2018. The 57-year-old has been trucking for 18 years. 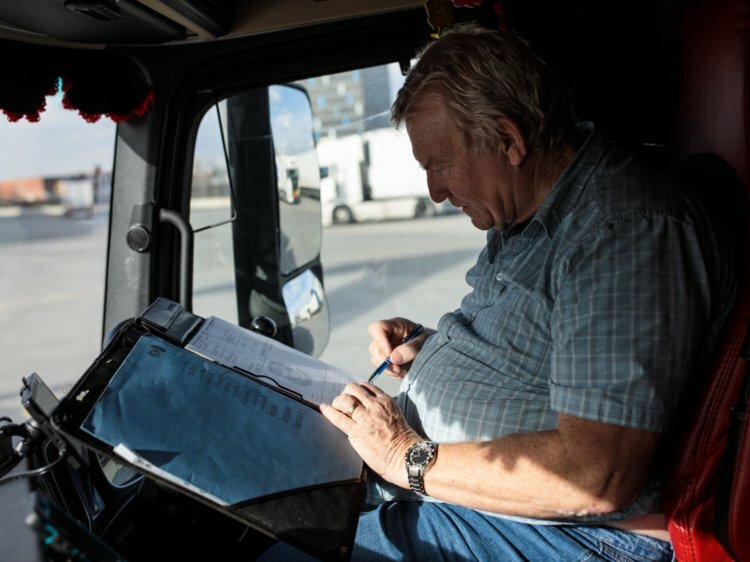 He’s one of many long-haul truckers who have told Business Insider that the electronic logging device mandate made their jobs hauling freight more dangerous and decreased their pay in 2018. While America’s 1.8 million tractor-trailer truck drivers are quite aware of what ELDs are, few consumers understand how the ELD mandate has affected their own lives this year. Electronic logging devices (usually called ELDs or E-logs) record driving hours by monitoring a vehicle’s engine. Some companies used ELDs for years. Others only started in December 2017, when the ELD rule came into effect under a larger act passed by former President Barack Obama in 2012. Called MAP-21, the act was the first highway legislation with long-term provisions since 2005. Previously, truckers may have logged their hours by hand with paper logs. What is the hours of service (HOS) law? The ELD by its own merely logs how much a driver has been working. What gives the ELD mandate teeth is the hours of service (HOS) law. Under HOS, truckers may drive a maximum of 11 hours in a consecutive on-duty window of 14 hours. After that, they must take 10 consecutive hours off-duty. These stipulations ensure drivers do not become exhausted and therefore more prone to accidents. In 2016, 4,440 large trucks and buses were involved in fatal crashes. The HOS law has existed since the federal government first started regulating trucking in 1938. But, the only way to ensure that drivers were following HOS was to review their paper logs, which are easily fabricated. As a result, many truckers could lie about their hours and work more than legally allowed. The ELD mandate required that most trucks implement logging devices by December 2017. This enforces the HOS law in an unprecedented manner. The law is one of many provisions in a larger act passed by former President Barack Obama in 2012. How does the ELD mandate affect consumers? The ongoing truck driver shortage became more pronounced in 2018 following the implementation of ELDs. The law “has drastically limited the flexibility drivers can build into their activity and tightened the constraints that diminish their operating efficiency,” Andrew Lynch, the co-founder and president of Zipline Logistics, told Business Insider. As a result, retailers have been more pressed than ever to find trucks to deliver their freight. In June 2018, there were 9.9 van loads to every available truck, compared to 5.6 in June 2017. To bid for drivers, shippers have upped their freight rates to record highs. Trucking companies have increased wages to recruit more and take advantage of this booming time in the freight world. For the end consumer, prices have gone up for many everyday products. Hormel Foods, which owns Skippy, Muscle Milk, and other food brands, General Mills, the owner of brands like Häagen-Dazs, and Betty Crocker, and Tyson Foods all said earlier this yearthat they raised some of their prices to offset high shipping costs. When Amazon increased the price of a Prime membership in April, they attributed the soar of shipping costs in Q1: a 38% increase year-over-year. PepsiCo, Mondelez, Procter & Gamble, and other retailers plan to hike up prices further yet due to the dearth of trucking capacity. Why do truckers hate the ELD mandate? ELDs and HOS limit drivers to a maximum of 11 hours driving in a consecutive, 14-hour block. But that doesn’t line up with the reality of a trucker’s day. Almost 63% of truck drivers say they wait three hours or more every time they’re at a shipping dock. So, their 14-hour time block for making money could be quickly used up while not driving. Drivers are paid by the mile, not per hour. So, some drivers have told Business Insider that they’ve seen their weekly pay sink due to the new time limits. The 14-hour time block also forces drivers to re-configure their sleep schedule and means that drivers crowd truck stops at the same times every day, meaning there’s less parking for others. Who supports the ELD mandate? Small fleet owners like those represented in the Owner-Operator Independent Drivers Association (OOIDA) contested the ELD mandate in Congress last winter. Politicians on both sides of the aisle supported the mandate, along with large companies represented in the American Trucking Associations. One key reason: Fatigued driving leads to car crashes. The Federal Motor Carrier Safety Administration estimated in 2014 that universally-mandated ELDs could prevent up to 1,714 crashes, 522 injuries, and 24 deaths each year. The ELDs also allow trucking, a notoriously sluggish industry when it comes to technology, to benefit from data and insights that aren’t available on a paper log. Will anything change with the ELD mandate? ELDs are likely to stay. But the leaders of the Federal Motor Carrier Safety Association (FMCSA), which enforces the road laws, have pledged to overhaul the HOS law to be more accommodating to truck drivers. “We’re moving as quickly as possible to reform hours of service,” FMCSA Chief Administrator Ray Martinez said at a recent public hearing. The proposed changes include revising the expanding 14-hour workday in case of adverse driving conditions and eliminating the mandatory 30-minute break, which often prove redundant when drivers already spend hours of their time on “break” while waiting for freight. These rules could ease some of the burdens of the unpopular ELD law, while ensuring roads are safe. “A lot of drivers say they’re against ELDs, but I think they’re more against the HOS law than the ELDs themselves,” Jason Poat, who owns a small trucking fleet in Wingo, Kentucky, told Business Insider.